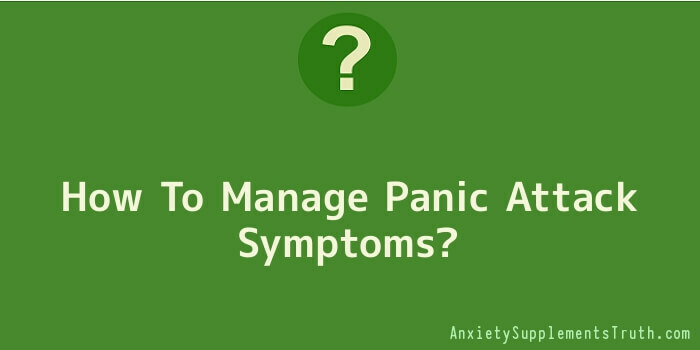 How To Manage Panic Attack Symptoms? What do people mean when they say they have anxiety attacks? Or even more severe panic attacks? Lots of people suffer from differing levels of anxiety in their lives. Other words that define anxiety are: apprehension, concern, anguish or dismay at some time in our life. Because we are human, we have all experienced some level of anxiety, apprehension, concern, anguish, or dismay at some time in our life. It’s a very natural occurrence to feel all emotional at some time or another. Panic attacks start to become a problem when it begins to rule our life; in other words, when it controls us rather than us controlling it. Often, anxiety presents itself in physical ways such as constant headaches, abdominal cramps, or shallow breathing. When the anxiety and ensuing panic attack is at its worst, it may feel as if you’re having a heart attack. You have a racing pulse, can’t seem to get enough air into your lungs, and panic starts to set in. Sometimes people will go to the hospital with the idea that they are having a heart attack – the panic attack symptoms can be that bad. When they are told that they are experiencing anxiety, they may feel like the doctor has told them, “It’s all in your head and isn’t real.” This couldn’t be further from the truth. Anxiety symptoms are very real, and those go through it feel truly physical effects. Just because’ it’s called “anxiety” and not “heart attack” doesn’t diminish the concern or seriousness of what you’re experiencing. Panic attacks come about when people stop going to certain places, or even stop leaving their homes altogether, because they fear the onset of another anxiety attack. When panic becomes this severe it can completely destroy any sense of well-being that someone may have previously felt. Anxiety and panic attacks can be successfully treated through therapy, or therapy and medication. The therapy is necessary to help work through the root of the anxiety. Medication may be necessary to help the individual think more clearly and feel more relaxed during the first stages of therapy, thereby making better choices and improving their ability to focus on the present. But medication should really only be viewed as a short term solution – anxiety can usually be resolved without long term dependence on drugs. A very common manner of working through one’s own anxiety is learning to breathe. As odd as it seems, many of us do not breathe correctly. We take short, shallow breaths when we feel upset or stressed. If we focus on taking deep, cleansing breaths the anxiety will likely diminish. It takes a concerted effort – why not try it now. Check your breathing. Are you feeling your lungs completely? Or are you rushing through your breathing because it feels like the most natural thing to do? Take a minute; time yourself. Count how many breaths you take in one minute. Then take another minute and see if you can slow it down by breathing deeper and longer with each breath. Breathe in through your nose, and slowly blow out through your mouth. Try breathing into your stomach at the start of each breath – this helps fill the bottom of your lungs. Then expand your chest and breathe into the top of your lungs to really get maximum oxygen into your system. Practice this whenever you begin to feel anxiety, apprehension, anger or stress. See if it works. Keep your own mental space healthy. If you need help, please seek it. There is no shame in asking for help in dealing with everyday problems, past experiences, or future concerns. Breathe deep. Ask for help if you need it. That’s what mental health is all about. With the right help you can gain control over your anxiety and panic attack symptoms, and start to get your life back again.